Choosing the right photo for your poster/brochure is the most important step. First you should have a clear picture of what it is that you are trying to advertise. To give you an example, I wanted to create a poster that would fit perfectly in a beauty/lifestyle/fashion category. Also, I wanted to attract a female audience, so I needed to find a feminine fashionable photograph. 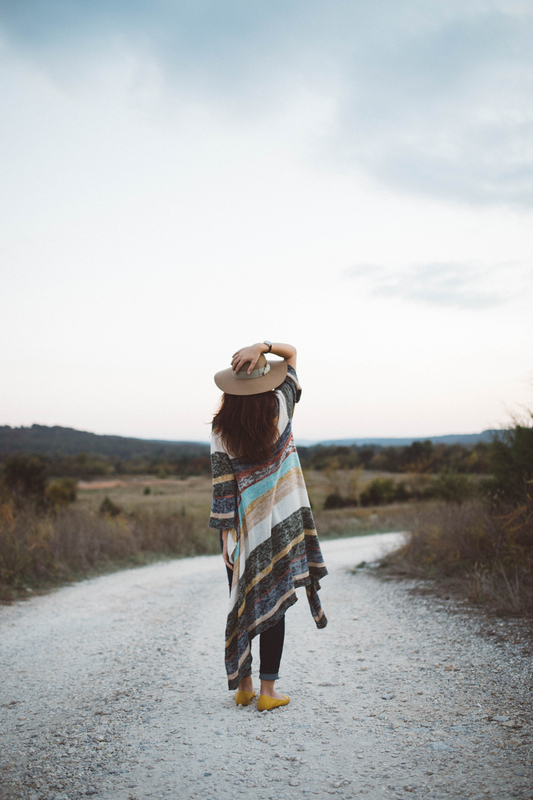 I went to Unsplash.com and I entered the word “beauty” in the search bar. I also could have entered the words “clothing”, “fashion” or “minimal”. Finally I found what I was looking for in the photo below. Photo is taken by Brooke Cagle. Notice that this photograph has a clear focus and minimal styling. This combination always works the best because it makes your job a whole lot easier. When looking for that perfect photo make sure it has a lot of uncluttered space and whites. What I noticed first when I looked at this photo is the blue stripe on the clothing. This is actually ideal, because my Dusty Chic Design Toolkit has the dusty blue color palette and I knew that this small stripe will connect everything together nicely. Yes, this is the part where Photoshop comes into play. Now that we found the right photo, we need to adjust the saturation. 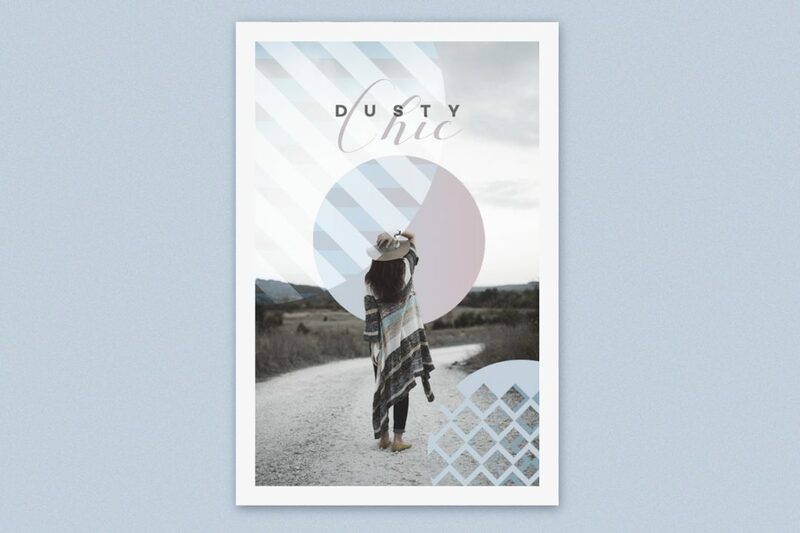 Dusty Chic Design Toolkit is well…dusty. 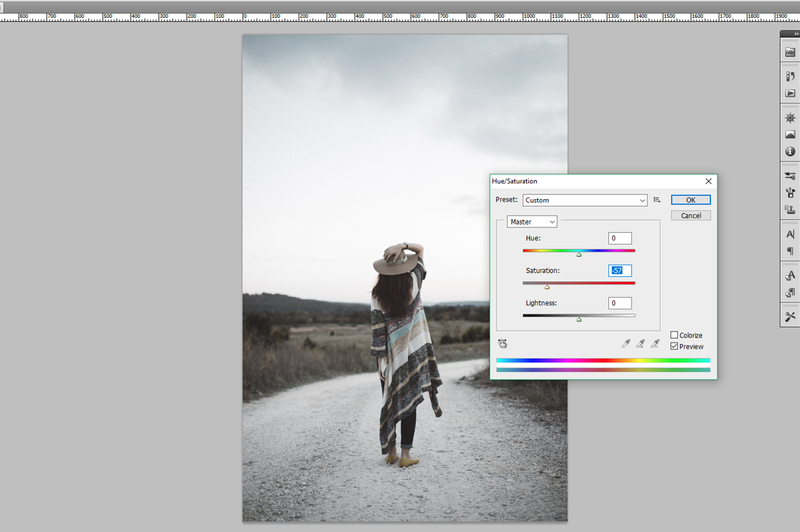 This photo has a lot of color hues that work great with dusty look but it just isn`t dusty enough. I need the photo a lot less saturated, the blue stripe on the clothing needs to be the same color hue as the dusty blue in my toolkit. I pulled the saturation level to a -57, notice how the photo gained the dusty tone. If I pull the bar even more to the left the image would go in total black and white mode. However that is not what I was going for, I love how I can still see the different color stripes on the clothing, plus, I now have that beautiful Dusty Blue color hue. The photo is now ready for introduction of toolkit design elements. 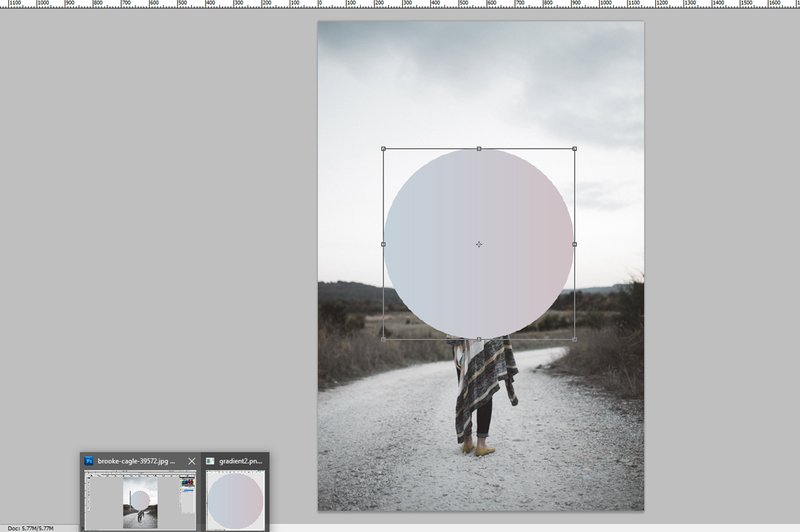 I will start by importing a gradient shape. I will place that shape on the spot where I want my focus to be in. Now that I have placed the shape, I need to see what is going on behind it so I will make it a bit transparent. 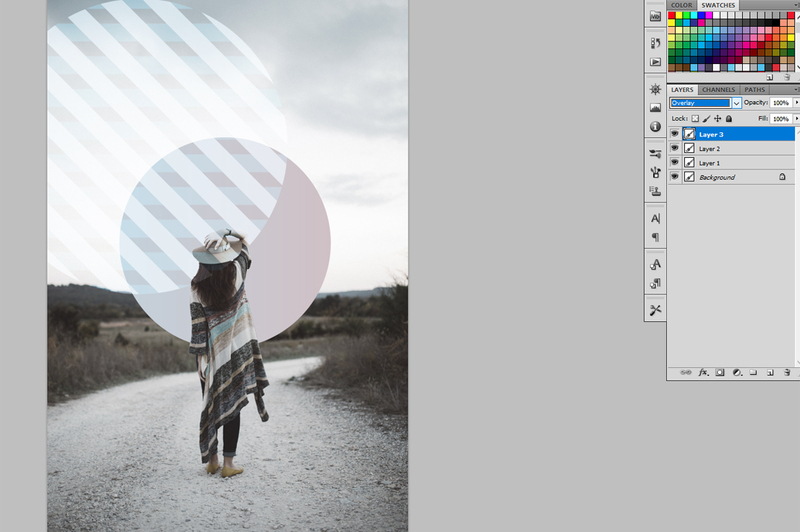 I did that because I will have to cut out the woman shape from the photo and bring it in front of the gradient. 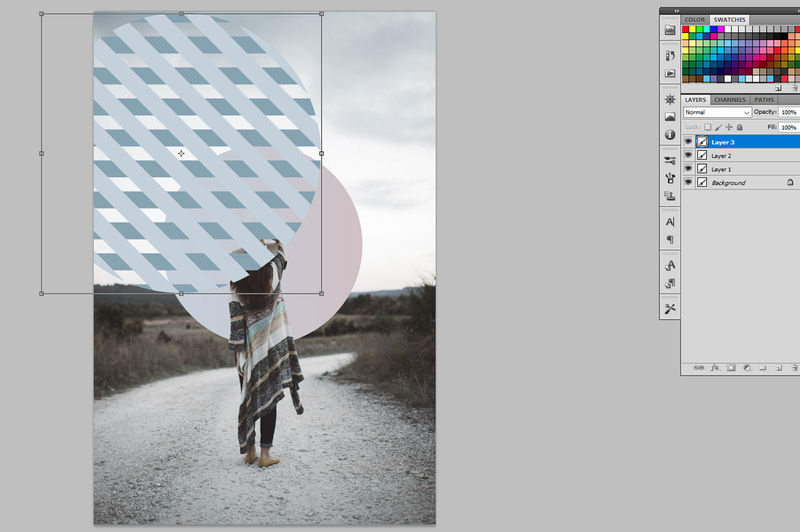 For that I am using a magnetic lasso tool. Once that I closed the shape with the lasso I just copy and paste it. 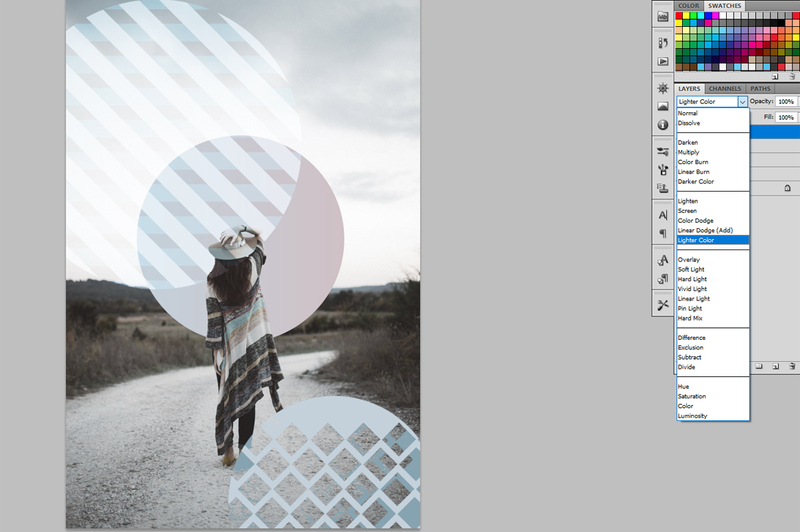 Now I have a new layer of the woman shape and I have to pull it all the way to the top in the layers panel. It is time to add another design element, this time I am choosing a shape that has a “knit” pattern. I will place it in a top left corner. The top of the photo is clean and white, the “knit” pattern would be lost in the clutter anywhere else. This way it will have a place to breathe. 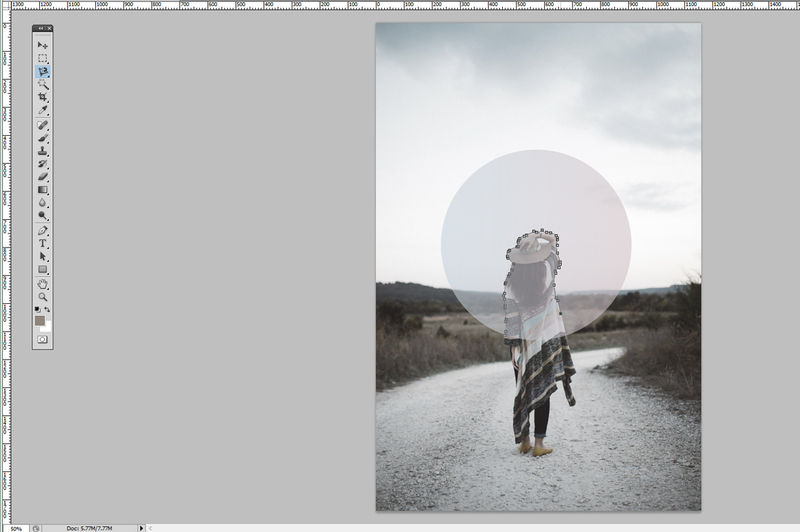 After the placement, I will use the panel with various transparency effects to see which one will work best. I chose the Overlay transparency effect. It works the best, it gave it a luminous feel and I can still see the “knit” pattern, just with a more gentle appearance. I will add just one more shape because I need to create a balance, but I don`t want to go overboard by adding to much. Again, I am using a transparency effect for this shape too, that way it will blend more naturally into its surroundings. I used Lighter Color transparency, notice how the color hues match perfectly with the blue stripe on the clothing. The last part, and for me, the most fun part is placing the text. Its very important to chose the right fonts, as with the photo, the font choice can also make or break the design. Choose wisely and be creative. Don`t mix to many fonts together, two fonts should be more then enough. If you are a super star in mixing multiple fonts then go for it. In my experience, two fonts should do the trick just fine. If you need a huge library full of awesome fonts stop by on Creative Market. There you will most definitely find what you are looking for. While placing your text, have in mind that you still need to think about the focus. If you want the text to be clearly seen, you need to place it near the focus. 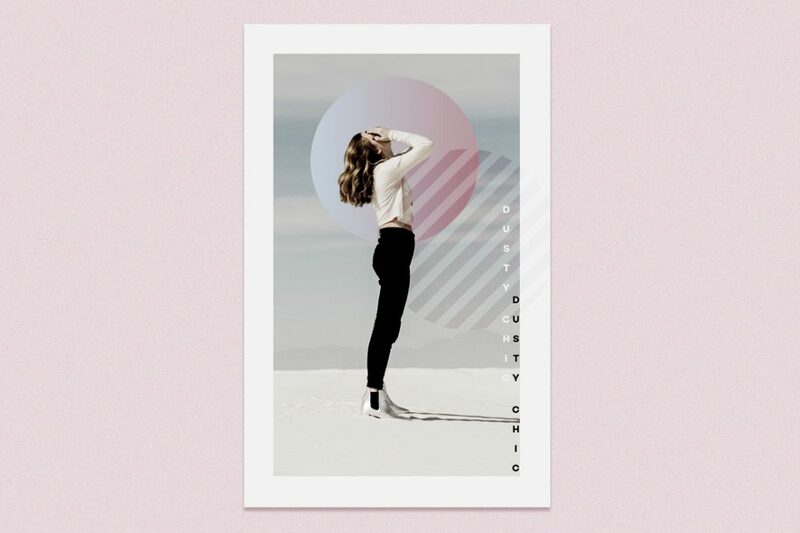 If you don`t want the attention on text but rather on the poster artwork place it somewhere near the edges. I did just that on the example below. That is it! 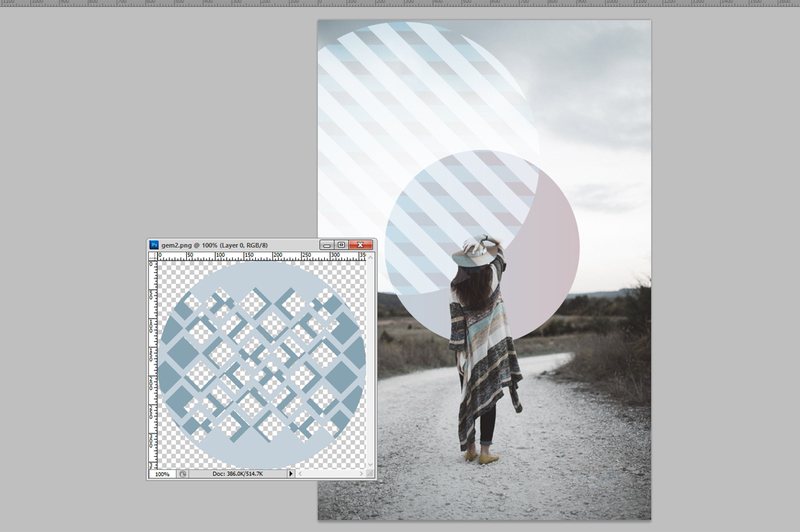 You have just seen my step by step process in creating cover artwork. If you have any more questions or you just want to say Hi leave a comment! I would love to hear from you. I hope that this short tutorial was helpful to you and I wish you happy creating!